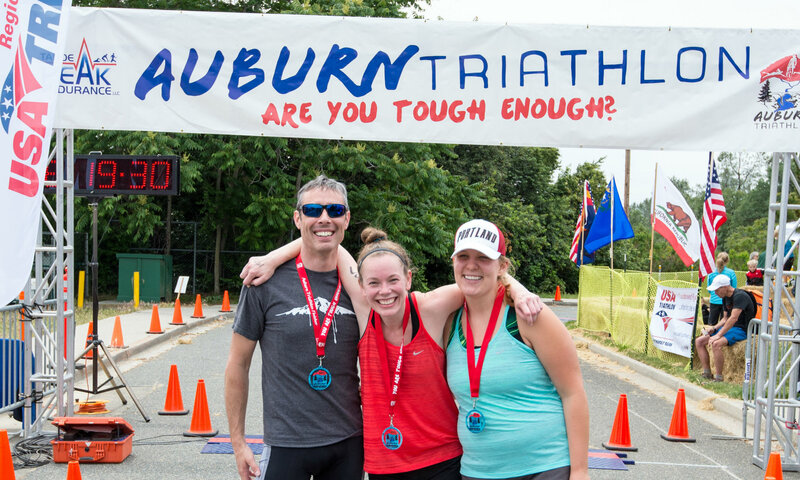 The cooler weather and great water temperatures gave way to the perfect atmosphere on Sunday for the 13th annual Auburn Triathlon. With four race distances to choose from, over 400 athletes competed in a swim, bike, and run, in and around Folsom Lake and the American River area. The women’s “World’s Toughest Half” Ironman distance triathlon was won by first-time half Ironman distance competitor, Kelsey Withrow. She was the fastest female swimmer of the day, which helped her keep the lead when during her bike she had problems with the chain coming on and off. Despite that issue, she was able to hold off the second-place competitor by having a strong run on the trails. The men’s overall winner of “The World’s Toughest Half” was Kevin Rudd from Campbell, California. He said the “World’s Toughest Half” is definitely the right name for the race because the course is the hardest triathlon that he’s ever done. Summed up in one word, Kevin described the course as “relentless.” Most notably relentless on the course is the bike portion with a ride that is up and down with not too many flat stretches. Kevin had the fastest bike split of the day which is his strongest of the three disciplines and helped him win the overall race. He mentioned he had an encounter with three four-legged animals that slowed him down a bit. The USA Triathlon Southwest Championships were held in conjunction with the International Triathlon distance race. The overall female winner was Elise Winter with a time of 2 hours 42 minutes. The overall male winner was JP Donovan in 2:14:42. The most interesting note of the day was the fourth place overall “Half” competitor Bruce Deakyne. He had the fastest swim and the fastest run splits of the day. Most first-time competitors described the course as tough but beautiful and would definitely come back next year for one of the four race distances.